I was super stoked the other day after a pleasant visit with my buddy Jim in Milwaukee to pop into a couple of Half Price Books and find some real bargains. One of them was a copy of Strategy & Tactics Issue #137 with the complete Men-at-Arms game (including the unpunched counters!). The cover by Angus McBride was licensed from Osprey's Men-at-Arms Series and depicts Celt Iberian warriors circa 130 BC. 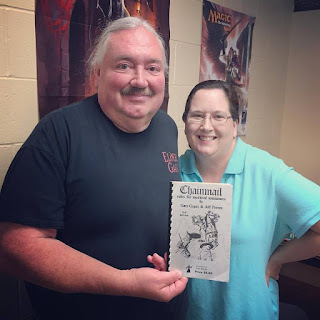 The magazine includes the complete game rules as well as 32 Battle Scenarios by Albert A. Nofi and James F. Dunnigan as well as an article on the same subject by Dave Arneson (and a bunch of additional content). The 6 pages of double-sided maps and the game charts and turn track are all on thin cardstock in the center. I'm really very pleased with this find!